-No comparison to Follies at all, very different shows with different intents. Drowsy aims at what might have been the George White Scandals of 1928 told with a 2006 wink, while Follies is a ghost story. Follies is enormous, Drowsy more like a small jewel - loved most of its pastiche numbers, even the idiocy of Georgia Engel spitting all over her butler - somehow it worked, because it didn't take itself seriously. -The set. Yeah, its obvious, but the first time the refrigerator opens you can't help but smile, and the use of the bed with the Chaperone herself (who steals the show, IMO) is gleeful. -Man in the chair (Bob Martin, the co-book author)- truly funny, and absolutely vital to the show's success. Without him the entire concept would fall flat, and he does it beautifully. -Sutton Foster - she doesn't do that much, I don't see a Tony nomination. Beth Leavel & Bob Martin stand the best chances. -I saw the show with 5 friends last night - 3 are from Jersey, so what can I say, LOL?! However, they are theater junkies themselves so hard to say. The show will depend upon good reviews and awards for its survival, the Marriot Marquis theater is huge - too big for the show. The inside jokes won't hurt, though the audience laughs will lessen as the show ages. But I think it might give Jersey Boyz a run for its money for Best Musical (just like Spamalot vs. Light in the Piazza last year), it will be interesting. Gotta run - off to Julia Roberts in Three Days of Rain! They sent an obnoxious e-mail saying if you're late, you don't get in until Act 2! Will report back later/tomorrow. Thanks Gary!! Okay I am really sick, sick, sick, sick, sick of you LA/NY people showing off. Now, now Twisted dont' go getting, well, all twisted! Anyway, I'm from near SF not LA. Jay, yeah I agree with all you said about DC, I was just concerned about the amount of money it was going to take to transfer and was afraid of the downside cash flow. Also the Marquis is just way too big, it even swallowed "Oklahoma". Yeah, I know "Jersey Boys' has a decent story but a Tony will just encourage more jukebox crap. I'm so jealous that you saw it in workshop and on off-Broadway. I saw it a few months after it opened with the original cast. I'm still obsessed with it! Just got home from Julia Roberts in 3 Days of Rain. Let me put it this way - it didn't get a standing ovation, and audiences stand for everything these days, LOL. It wasn't awful, but it wasn't good. To my surprise, the play was a bit shallow and dragged. Paul Rudd was terrible in Act I, his performance didn't match the character (though the writing was in part to blame), but he was good in Act 2, even if he slightly overdid a certain "tic" which I won't specify re: plot point. Bradley Cooper (of Wedding Crashers, which I haven't seen) was very good - the play was engaging when he was on-stage. As for Julia, well, she didn't do much of anything in Act 1, and her accent in Act 2 was off. She didn't stink, but she was merely competent and forgettable. 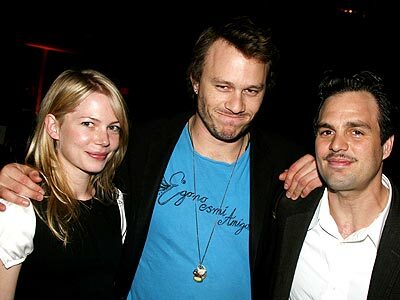 LOLA: Oooh, Heath & Michelle at Awake & Sing on Monday - damn, saw it last week (really liked it - it creaked, but it moved me, good acting, especially by Zoe Wanamaker & Lauren Ambrose of 6 Feet Under...Mark Ruffalo was fine, didn't understand a word Ben Gazzara said). GARYD: Sorry for being persnickety - Oklahoma! was at the Gershwin. So true, so true. Hell, I still call it the Uris !?!? Obviously time for me to renew my Aricept scrip! Thanks for the correction. Imagine if you had run into them, wouldn't you have died? I am not sure why Julia is trying her hand at Broadway, I guess they all do at one point. Didn't even Al Pacino try his hand at it for a while? As for RENT - Estefue, not only have I never seen it live, I have yet to see the film, I think I will rent it Friday night, I do love the music. I am desperate to see some theatre now! I may have to get my Chicago DVD out and watch it again! It has been a while. Heath & Michelle: You ain't kidding, I would have wet myself!! I'm a bit of a jaded NYer in that I see celebs all the time, particularly since I go to so many shows, but those two are at the tippy top of my list post-Brokeback, that's for sure. Boy do I wish I was there! Al Pacino: Actually, he was trained in the theater and won Tony awards for Does the Tiger Wear a Necktie? (featured actor) and The Basic Training of Pavlo Hummel (lead). He returns to the NY (and maybe other?) theater every few years, not that long ago I saw hiim in a fabulous revival off-off Broadway at Pace University of Brecht's "The Resistable Rise of Arturo Ui". Other in the cast included Paul Giamatti, Billy Crudup, Charles Durning, Linda Emmond, Steve Buscemi, Dominick Chianese (Sopranos), John Goodman, Chazz Palminteri, and Tony Randall in what I think was his final theater performance before his death. I have never been a huge fan of Pacino's screen performances, I think he chews the scenery too much (even in overrated Godfathers - I know, sacrilege! ), but he was amazing in this play. I took my dad, he still talks about how great Pacino was. They discussed a Broadway transfer, but trying to reassemble that amazing cast proved impossible. Hey that was no ramble, I read it twice! I would kill to see Pacino live. I had no idea he had won Tony's. Did you ever watch Oz? There is a regular on there, his name is B.D. Wong, I didn't even know he did theatre, until they did a "theatre like" version of Oz one episode. It was actually pretty good, but he was amazing. I knew when I saw it he had to be trained in theatre. And when I checked sure enough he was, maybe I will be lucky enough to see him in something one day. I first saw B.D. Wong in 1988 in "M. Butterfly", for which he won the featured actor Tony. He was incredible - so much better than the movie. His co-star was John Lithgow, also superb. He has never quite equalled that performance in the NY Theater, though last year I am told he was good in Sondheim's "Pacific Overtures" (I skipped the Wong cast since a Japanese company did it in Japanese at Lincoln Center just over a year earlier - one of the most amazing things I ever saw). I liked Wong in Oz, but had the show became too repetitively violent for my taste so I stopped watching pretty early on. I bet Pacino returns to the stage in the not-too-distant future, he's always said it is his first love. If it's NYC, I'll let you know, you would have to come!! I must say that I love the theater and get back to NYC at lrast once a year to see a few shows. But we do have good theater here in ATLANTA GA. The last show I saw here was THE COLOR PURPLE, and I loved it. THE same cast that is in NYC was here in ATL. ( Well mabey one or two cast members were changed for NYC ). Standing O's here in ATL and LOVE the CD. Anyway I must get up there and see Gray Gardens. Hope your brother enjoys 3 Penny. Cyndi Lauper's role isn't that big, but she does a really good job. Does your brother live in NYC? If so, he should see Sweeney Todd - and so should you, it's amazing. WOW lucky you, I bet he was amazing! Funny when Oz was on TV hubby watched it and I never did, every time I tuned in I was totally put off by the violence. Then I bought him season one on VHS and we started to watch it from the beginning. By the time we were up to season six (I bought the first five) I was really getting attached to the inmates! lol And funny the violence didn't seem as bad to me. And speaking of theatre.........Rita Moreno was also a regular and we know she has done theatre! As well as being in West Side Story, the movie, I really like her. NEW YORK Apr 19, 2006 (AP)— "Mamma Mia! ", the campy, crowd-pleasing musical inspired by ABBA disco-pop hits, is heading for the big screen, the trade paper Variety reported Wednesday. Tom Hanks' production company, Playtone, the paper reported, has inked a deal with Littlestar Services Limited, the company run by the hit show's producer, Judy Craymer, and ABBA songwriters Benny Andersson and Bjorn Ulvaeus. Discussions are now being held with Universal Pictures to finance and distribute the film. A Universal spokeswoman declined comment on the deal, but confirmed the story's details. The movie is expected to be released in late 2007, Variety said. The musical which includes 22 ABBA classics like "Dancing Queen," "Take a Chance on Me" and, of course, "Mamma Mia" has earned $1.6 billion worldwide since its London opening in 1999. I love Mamma Mia, probably the only time I went to the theatre and people were dancing in the aisles! IMO, the best show on Broadway is Sweeney Todd. It is so brilliant it brings tears. Also thrilling and funny. I was in NYC visiting a friend and we stopped by "Sweeney Todd" for the Sunday Afternoon Mat on Dec 11th. They had great seats in the orchestra, but in the end we passed them up to go see the last performance of "Movin' Out" - although we had seen it before. MY friend grew up on Long Island listening to Billy Joel (who was there). I've always kinda regretted that decision as "Sweeney Todd" is supposed to be brilliant and I do like Sondheim. I've recently read where a similar production(small cast playing their own instruments) of "Company" by the same people responsible for "Sweeney" may be transferring to Broadway.